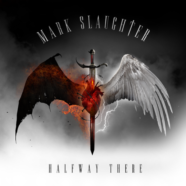 Released in May on CD and LP via EMP (with SPV in Europe, and Universal in Japan), the US based label of Megadeth bassist David Ellefson, HALFWAY THERE, has been touted as a stunning return to form for Slaughter, channeling the familiar Hard Rock sensibility of classic-era SLAUGHTER releases like Stick it to Ya and The Wild Life on “Hey You” and emotionally-charged title track “Halfway There”, a classic power ballad of epic proportions, with a mature, progressive, Metal bent evidenced throughout the album. Featuring stunning artwork from renowned artist “Mister” Sam Shearon, HALFWAY THERE debuted on the BILLBOARD Rock and Hard Rock Charts, and the first single “Hey You”, hit the top 20 on the MEDIABASE Classic Rock Charts, with airplay on Rock staples across the country including Sirius XM Eddie Trunk and Hair Nation, and nationally syndicated shows like NIGHTS WITH ALICE COOPER. In addition to releasing 2 solo records, Slaughter still remains active playing dozens of shows a year with his namesake band, SLAUGHTER.